Thanks to our friends at Fox Home Entertainment we have a fun coloring page to share and a dvd giveaway to promote the newest Strawberry Shortcake adventure to come to home video. My daughter is always thrilled whenever a new animated Strawberry Shortcake video comes out and will the excited that this adventure features stories revolving around cute little puppies. 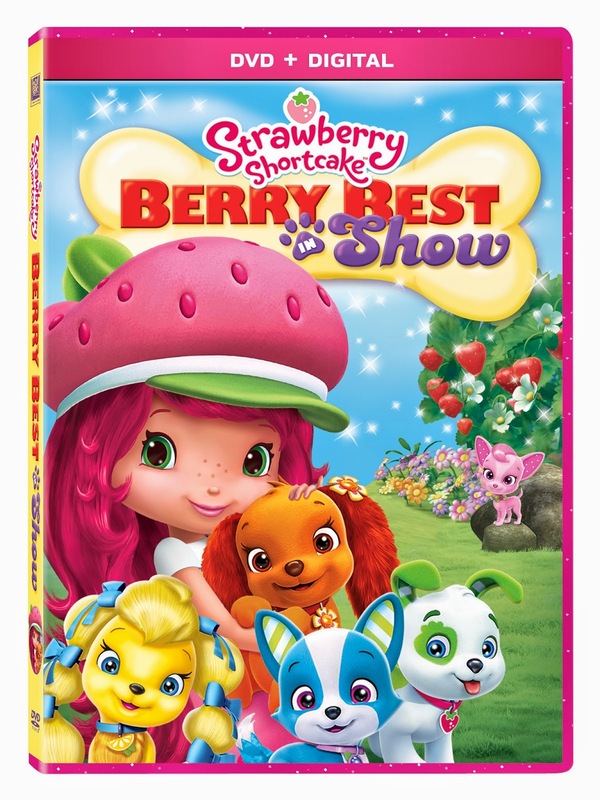 STRAWBERRY SHORTCAKE: BERRY BEST IN SHOW will be released on dvd and for digital download on May 12, 2015. For a limited time, consumers will receive a copy of the “Perfect Puppy Digital Story Book Download” by Cupcake Digital, Inc. with their purchase. Hurry, supplies are limited! Strawberry Shortcake: Berry Best in Show features Strawberry Shortcake and some new furry friends in delightful “tails” about being yourself and encouraging others to do the same. During his road trip to find homes for his orphan puppies, Huckleberry Pie and his four-legged crew get stranded in Berry Bitty City. Luckily, Strawberry and her berry best pals decide to help out with the strays in “A Boy and His Dogs.” Blueberry Muffin and Huck become “Partners in Crime” when they try to write a mystery story together…with surprising results. And the fur is sure to fly when the girls try to help Huck start a dog shelter in “The Mystery of the Disappearing Dog Show.” It’s a howling good time with sweet doggy delights for everyone! UPDATE: Congratulations to Laura from Clawson, Michigan who won the dvd/digital download. While you are waiting for Strawberry Shortcake: Berry Best In Show to arrive, have some fun with with this coloring page that highlights Strawberry playing with her new furry friends. DISCLAIMER: A Geek Daddy Blog will be responsible for selecting the winner of this contest, but Fox Home Entertainment is responsible for fulfillment and delivery of the prize. By participating in this contest you waive any liability towards A Geek Daddy Blog or its publisher that may arise from your involvement with this promotion. If you win this prize on another blog, you will not be eligible to win again. Winner is subject to eligibility verification. Prize will be delivered by UPS or FedEx so no P.O. Boxes are allowed as mailing addresses. A Geek Daddy Blog did not receive any financial compensation but did receive a review DVD for the blog and the prize that is being awarded to one of our readers for this contest. A Geek Daddy Blog is hosting this contest as a benefit to our readers. Any opinions in this post are my own.